Modern, clean, safe and WONDERFUL! After 31 hours of traveling, 24 of them in the air, any city would look beautiful from an airplane window and Singapore was no exception. The city looked beautiful and, as we would soon find out, it just didn't look beautiful it was. Changi International Airport was an excellent prelude to what Singapore would be like: modern, clean and remarkable. Perhaps what made our impression so memorable was the beautiful orchids throughout the airport. We cleared immigration and customs and were soon on our way by taxi to our hotel, the Mandarin on Singapore's famous Orchard Road. As we wound our way from Changi Airport to the hotel we were amazed by the look of the city. It was a brilliant, sunny day with a magnificent blue sky and everything just seemed so perfect against such a day even to the two of us who were about to drop dead from the travel. The first two things that strike you about Singapore are how modern and clean the city is. The downtown area is populated by modern buildings with many qualifying as skyscrapers. And, unlike many other cities we've visited, the streets were clean. Singapore is known worldwide for its cleanliness. The next thing that strikes you is the friendliness and courtesy of its people. Singapore is truly the melting pot of Southeast Asia with its population being made up of various ethnic and religious backgrounds. Walking throughout the city one will find this mix of people, races and religion fascinating and interesting. 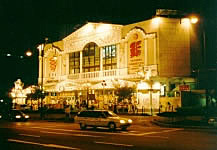 Our hotel, the Mandarin, was located on Orchard Road in the center of Singapore's shopping district. Orchard Road is the equivalent of New York's 5th Avenue. It is populated with modern buildings most of which are retail sales establishments. All the better names can be found on Orchard Road along with a variety of large department stores. The road is wide with many trees and some statues. We were fortunate enough to visit just prior to the Chinese New Year and Orchard Road was decorated and brightly lit at night in preparation for that. We arrived at the hotel about 1:00 p.m. totally exhausted from our flights. The flights were better than expected, but we still hadn't slept in almost 48 hours. No, cat naps of a few minutes here and there do not qualify as sleep! Still we forced ourselves to stay awake a little longer before collapsing in a good night's rest. We walked along Orchard Road the better part of the afternoon visiting some of the shops and just after 6:00 p.m. we decided we'd better eat something before retiring. I'm not very proud of this, but our first meal, a sandwich, was at a Denny's restaurant. How low can you go? Following our quick sandwich we returned to the hotel where we crashed by 7:30 p.m. to sleep undisturbed until a little after 7:00 the next morning. From that point forward we had already adjusted our internal clocks to the 11 hour difference between New York and Singapore. Awaking the next morning we were anxious to get out and begin to see some of the sights of Singapore. With our trusty guidebook in hand we set out to conqueror the city and what better way to do that than by walking. Unlike most of the Far East Singapore does not have much of an ancient history. Relatively speaking it is a modern history that dates from 1819 when Thomas Stamford Raffles, an English representative of the East India Company, landed on the island of Singa Pura (Sanskrit for "lion city") to establish a British trading settlement. Within three years the tiny island with a population of 200 Malays had grown to an astonishing 10,000. 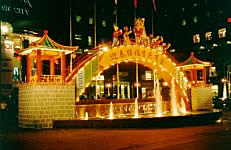 Immigrants came from China, India and Arabia to fill the growing city. Today, from a tourist viewpoint, the city is broken into districts: Colonial Singapore, Chinatown, The Arab and The Indian districts. Each district has its own flavor and something to offer any tourists. Anne and I would begin by visiting Chinatown and Merlion Park. As I mentioned previously, Singapore is an amazingly modern city, but the surprising thing to me was how well the modern and the old mixed. You would be walking down a street with modern buildings everywhere and then nestled between them a old building or temple. It was remarkable to view the old and the new in such close proximity.